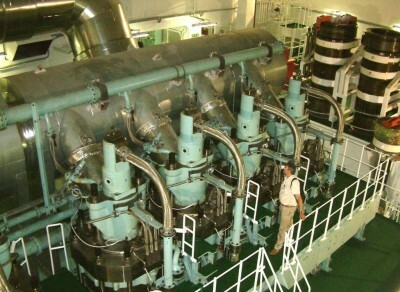 Some years ago I toured a container ship as a guest of its ambitious young Yugoslav captain. It was by far the most awe-inspiring company tour I’ve ever been on; the sheer size and scale of everything we were shown made us feel utterly antlike, awestruck, and then awestruck again, in a different way, at the magnificence of what people are able to achieve when they put their minds to it. These container ships are commonly 300 meters long or more, and they burn a very filthy low-grade petroleum sludge the consistency of Nutella that must be warmed in order for it to liquefy to a combustible state. For this reason the engine room, which seemed the size of a ballroom in a ducal palace, was unbelievably warm, even though the building-sized engine was barely idling. There are nearly five thousand container ships in total (plus over thirteen thousand tankers and almost nine thousand “bulk carriers” of iron ore, coal and so on,) and all these enormous vessels are plowing back and forth across the ocean at every moment, spewing all sorts of muck into the air and water in order to get us our cheap consumer goods. The pollution created by these ships is gargantuan, despite the shipping industry’s ludicrous attempts to acquire the PC-friendly veneer of “green transport.” Shipping contributes to the wreckage of ecosystems by belching rapacious jellyfish and other foreign beasts out of their ballast tanks; shipping contributes over 1.5 billion metric tons of CO2 exhaust every year (a rapidly growing figure); particulate matter from shipping exhaust rains onto the earth by the thousands of tons every day, infusing even the Arctic snow with soot and hastening the Arctic melt. Container ship captains race across the oceans at maximum speeds in order to earn their bonuses; their ships are packed to the gunwales and beyond in order to make each trip pay as much as possible. There are complex, finely calculated risks of all kinds that the captains must take. For example if the weather is bad, it is quite possible that a container or ten will go springing straight off the boat and into the sea, so the containers must be arranged with the utmost care; the maximum number, but not so many that they go popping off in a storm. It’s said that over 10,000 containers are lost at sea every year. Photographs can’t do the Port of Long Beach justice because the scale is impossible to convey. When you are in it, this endless vista of containers stacked at various heights reaches straight across the horizon, acres and acres of colored boxes strewn across your whole field of vision like a Lego set for giants. When faced with such a multitude it’s hard to remember that an NBA player could stand up straight in each one of those tiny Lego boxes — well actually, one million real Legos fit in each one. Just one standard forty-foot container can carry as much as 59,040 pounds of Snuggies, shiny leggings, Maroon 5 t-shirts, blenders, Christmas gewgaws etc., and over 100 million container loads cross the oceans every year. It’s a fearful sight in a way, the Port of Long Beach, this endless, crushing vista of metal and dust, with not so much as a blade of grass to relieve the impression of an infinite, silent or clanking perpetual machine, of a global engine, of “global industry”; compare this to say, a view of Central Park, and you’ll feel you’ve landed in a nightmare scene out of Mordor (or Isengard, I guess). Or, look at it from the point of view of human will and ingenuity, and you can’t help but admire, then, all the power, all the cleverness and craft that is required to keep this monstrous metal beast alive, an ocean of boiling oil pounding and churning through all its countless thousands of colossal hearts of hot steel. So how absurd is this, that we should foul the oceans and the air with these huge container ships, that the polar bears should die and the cities drown, so that some feckless citizen can go to Wal-Mart, buy a plastic bird feeder Made in China and thereby feel helpful to nature at the low cost of $3.49? How come is all this? Because the American idea has quite plainly concentrated itself in just one word: MORE. Not better, not “enough”, but simply, MORE. How much do you want? The answer is always the same: MORE. More money, more things, more cars, more food, more booze, more bedrooms in a bigger house; bigger, faster, all you can eat, more than you want, for greed is good. There’s really no point in telling people that they shouldn’t have what they want, because if they want it they are just going to have it anyway, if they can. But quite often we think we want things that in the event turn out to be not so desirable, like a whole lot of cocaine, for example, or we squeeze in a final helping of dessert. The mindlessness of this kind of materialism is clearly terrible for us all. But it’s not the materialism itself that is bad; there is a logical basis to it, viz., a keen concern for the physical things that surround us, and that is a rational response to chaos and terror. Beautiful dwellings and gardens, beautiful clothes, lovely food carefully prepared; these things can be sought, acquired and enjoyed with restraint and intelligence, without ruining the earth. We could have a rational materialism based on quality and order, on respect for our ecosystems and environments; we could actually expand our materialism to include the earth itself in the surroundings we mean to protect and beautify. There are signs that a new materialism is already begun in the Western world. The locavore movement, slow food and the rise of farmers’ markets, the renewed interest in all kinds of craftsmanship; there’s a move toward quality, toward buying things from local craftsmen, toward staying away from the big box stores; these are quiet and gradual changes, but they are important; maybe in the end they are more important than explicit attempts to mock or revile our greed, as Bill Maher did so effectively in his “Christmas Message” to Oprah Winfrey last week. As distressing as it is to consider that there is a lot of suffering in this world, and as necessary as it is to put that consideration first in a sane worldview, making things around us as beautiful as we can is still a worthy employment. The usual Manichean (or should I say American) habit of taking everything to extremes never seems to reckon with the possibility of a middle ground. If we redefine our materialism with an eye to the full appreciation and use of all we have, without mindless gluttony or hoarding, that alone might do more to save the earth than any amount of satire, or lobbying or politicking. Which brings me to the End of the World. When we hear so many scary things about the wreck that is being made of everything from politics to education to industry, it is very easy to become so distressed that the literal End of the World does, in fact, seem nigh; one fears that human beings might be fated to perish from the earth. But there is another way to look at this, which is that the world really does end every single day, and we have to remake it all again the next day. In reality, we must decide every minute how to make a new world. Maybe it’s not doom that we are facing; it’s a difficult and interesting problem, instead; one that requires that we not throw up our hands in despair, but that we use all our ingenuity and energy to solve. Maria Bustillos is the author of Dorkismo: The Macho of the Dork and Act Like a Gentleman, Think Like a Woman.